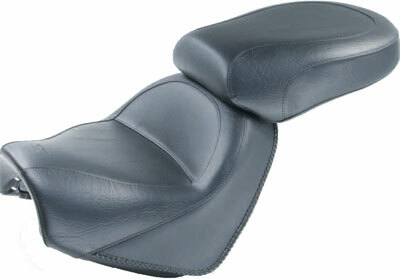 Same as the Studded Wide Touring Seat except the Vintage Seat does not have studs or conchos. The 15.5" wide driver bucket sits you at the ideal cruising angle and is one of several design improvements over the stock seat. The entire 11.5" width of the comfortable passenger seat is fully supported by Mustang's unique internal steel support wings- no sagging on the edges, no more passenger complaints.